Nearly a quarter of all people under 17 years old is Latino. It should be a high priority to provide education opportunities this segment of our communities for the sake of a better future for everyone. Doubling the student loan interest rates does exactly the opposite. Don't double the rates! For most Hispanics, education and the search for a better life is the reason they or their ancestors immigrated to the U.S. Many young Hispanics hear the mantra; we came to the U.S. so that you could go to college and be educated. Tienes que ser una persona educada. You have to be an educated person. Education is engrained in the culture. It is paramount to the Hispanic community because it is tied to the aspirational promise of the United States. Nearly 89 percent of young Hispanics say a college education is an important component of achieving success in their life. Sadly, partly due to cost, 48 percent of this growing population says that they do not plan to get a college degree. Getting the fastest growing segment of our countries population invested in attending college should be of the utmost importance for all elected officials. However, there is a segment of Congress ready to allow the interest rates of subsidized college loans to double. This increase will affect over 7 million students as soon as July of this year. The proposed interest rate increase for student loans would be especially devastating for Hispanic students. Students who receive federally subsidized loans on average have $25,000 debt at graduation. If Congress allows student loan rates to double, 986,494 Hispanic students would be affected. Hispanic student enrollment is on the rise , according to a Pew Hispanic Center analysis of Census data college-age Hispanics accounted for 1.8 million, or 15 percent, of the 12.2 million enrollment of young adults in two - or four-year colleges. Hispanics have managed to make great strides in their number and share of young students in colleges and universities. Doubling the interest rates on federally subsidized college loans could reverse this trend. For those in Congress who would rather play politics with people's educational future, the math does not add up. Saving a few dollars up front but keeping low income students from getting an education does not pay long term dividends. On Friday, House Republicans unveiled their solution by passing legislation which would stop interest rates on federal student loans from doubling by cutting $6 billion dollars from a health-care-reform law fund for breast and cervical cancer screenings, child immunizations, and prenatal tests for birth defects. This poison pill is all but certain to die in the Senate where Democrats had crafted legislation which would pay for the extension by closing tax loop holes for lawyers, architects, and other professionals in small firms. Nickel and diming our future leaders, is a terrible strategy for the prosperity of our country. Arizona, with a large Hispanic population, is a microcosm of the country and shows how the stifling effects of this rate change on Hispanics' educational opportunities could affect the nation as a whole. A recent report by the Morrison Institute for Public Policy notes that the Hispanic education gap puts Arizona at risk. Their executive director, Susan Clark-Johnson, stated "Latinos eventually will comprise a majority of Arizonans and provide an increasingly larger share of the state's leaders, workers and tax base, If we do not close the educational gap, all of Arizona will suffer the consequences. " The reality is if we do not close the education gap the country will suffer. 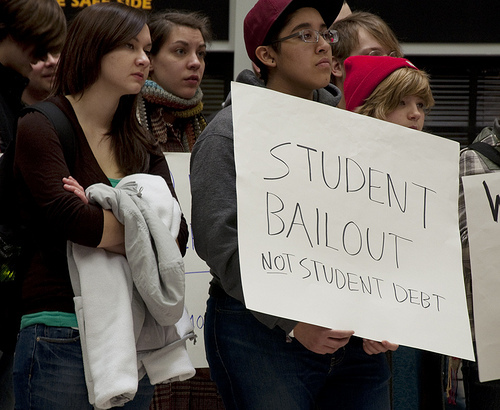 Letting the college student loans increase will only exacerbate this problem not fix it. The Obama Administration in pushing to keep costs down, are speaking to a huge problem facing the country; student loan debt actually exceeded credit card debt last year, creating the prospect of mass default. Fleecing our young peoples' opportunities to achieve a quality education is short term political thinking at its worst. Politicians on both sides of the aisle see education as a bedrock institution for American society. In a fragile economy can we really put that level of financial strain on our future leaders? Currently, 23 percent of children under 17 are Hispanic, educating this growing segment of the population and helping them to become productive members of our economy should be a central concern to all of our elected officials. Hispanics distinguish themselves every day with their strong work ethic, their leadership and their productivity. They have shown, they are ready to continue to grow, the question is will Congressional Republican's help them?